Neil Behnke, a volunteer with the nonprofit organization Black Forest Together, was chosen by the public as the grand prize winner of the second annual John Deere “Small Machines. Big Impact.” contest at the 2018 John Deere Classic Chairman’s Dinner. 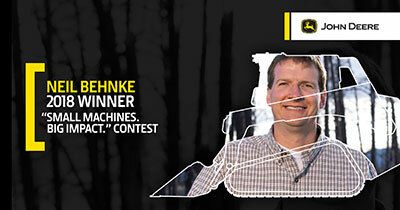 As the winner, Behnke will take home his choice of a new model from the full portfolio of John Deere small-, mid- and large-frame G-Series skid-steers and compact track loaders (CTLs), with a WorkSite Pro attachment to help with his project, “Rising Above the Ashes.” This project helps residents of Black Forest, Colo., clear their land of dead, dangerous trees, resulting from the most destructive fire in Colorado’s history. The June 11, 2013, fire spread across 14,000 acres in 10 days, destroying more than 500 homes, causing $85 million in damage and claiming two lives. As a result of the overwhelming response to the contest, John Deere also announced that it will help the two runner-up finalists in completing their community projects with a yearlong lease on a skid-steer or CTL from John Deere Financial. The runners-up are Kobus Appelgrijn of New Port Richey, Fla., and Anita Will of Ridgefield, Wash. Through West Pasco Habitat for Humanity, Appelgrijn’s project, “Restoring Neighborhood Pride,” uses the help of over 50 volunteers to revitalize 40 badly deteriorating homes to help create a thriving community. Will’s project, “Trailblazing Outdoor Connections,” is transforming Whipple Creek Regional Park from a dilapidated area into a community staple, with more than 8,000 volunteer hours donated since restoration began in 2011, growing annual visits from 1,000 to 54,000. Additionally, all three finalists will receive a $2,000 stipend to help in the completion of their projects, donated by John Deere and their local dealers. These finalists’ local dealers are: 4Rivers Equipment in Colorado Springs, Colo.; Dobbs Equipment in Lutz, Fla.; and Papé Machinery in Portland, Ore.
Ambius took home 27 awards at this year’s AmericanHort’s International Plantscape Awards, held July 15 in Columbus, Ohio. The organization presents the International Plantscape Awards annually, honoring outstanding interior plantscaping from across North America. Projects are entered into one of 10 categories and judged by veteran professional interior plantscapers. Marvin Storner, Wildlights St. Louis Zoo. Charlee Storner, based in St. Louis, was recognized for her holiday designs at a children’s hospital with the Diamond award, one of the evening’s most prestigious honors. The Toro Co. entered into a new partnership with Kinetic GPO, a cooperative purchasing organization established for public sector and MASH (Municipalities, Academics, School Boards, and Health and Social Services) entities across Canada. The partnership will remain in effect until May 23, 2021, with an option to extend the term for an additional period of up to two years. Contract number 18-02 provides exclusive pricing and access to Toro groundskeeping equipment to public entities in Canada and helps these organizations reduce procurement costs by leveraging group purchasing power and simplifying the overall procurement process. Included in the portfolio of products available under the contract are Toro’s line of commercial mowers, snow blowers and utility vehicles, among other product lines across Toro’s commercial, residential and landscape contractor (RLC) and Sitework Systems businesses. The contract officially took effect on May 24. LandscapeHub, an online marketplace for the nursery and landscape green industry, celebrated its first year as a company. When LandscapeHub was first starting out, it had five suppliers and 10 buyers. Today, they have more than 100 suppliers and 1100 buyers.